Today's So Shoe Me is the Salma Hi by Acne, $1150, available at Solestruck. Take a step forward in some signature strappy sandals that can be worn to tall to the knee or at short and straight at the ankle. 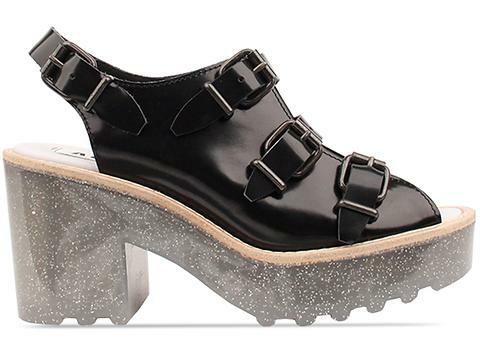 A glossy glitter rubber sole adds an on trend transparent touch to these grunge and glamour sandals. The strappy gladiator attachment gives you total control over the look of your footwear and you can decide weather to go full-out strapped and loaded or buckled and basic. Pair these punk perfect heels in all their strappy goodness with a semi see-through dress and a black bikini for the perfect beach day style. So Shoe Me a pair of sparkling rubber heels that will add a little (or a lot) of edgy strapped perfection into my daily summer wardrobe.